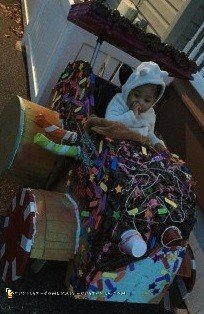 My 3 year old daughter, Abby, is wearing this Vanellope von Schweetz wheelchair costume. 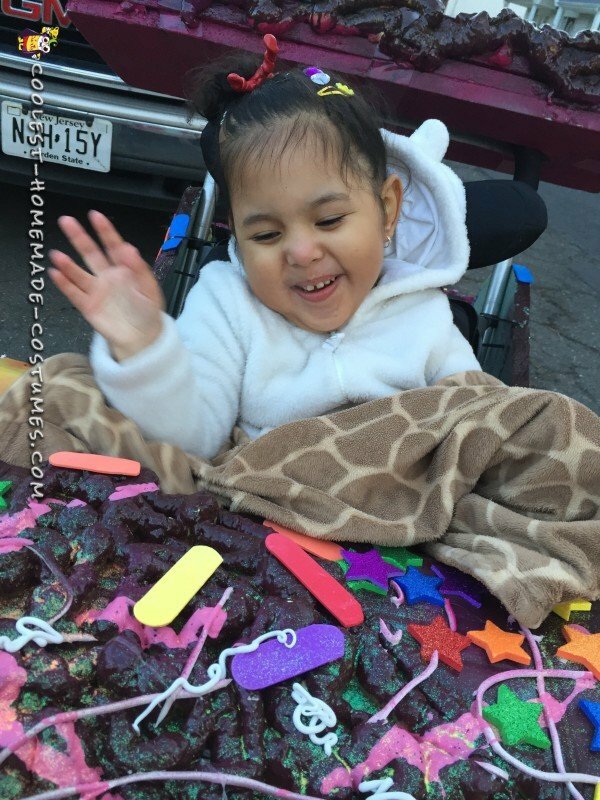 Abby uses a wheelchair/adaptive stroller to get around. And it tends to attract not so great attention to us both on a daily basis. Abby was born very prematurely, I was only 23 weeks pregnant. She’s had 27 surgeries 21 of which were brain surgeries. Between the wheelchair and surgery scars kids don’t exactly try to befriend her because they think she’s hurt or can’t do anything because of the wheelchair. 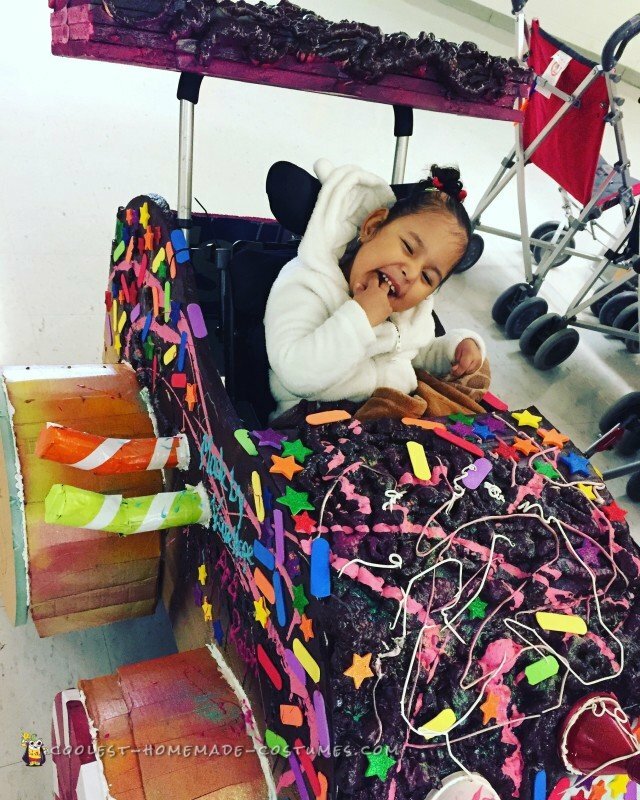 The world sees her as this less than person because they can’t see the absolute beauty in her chair. 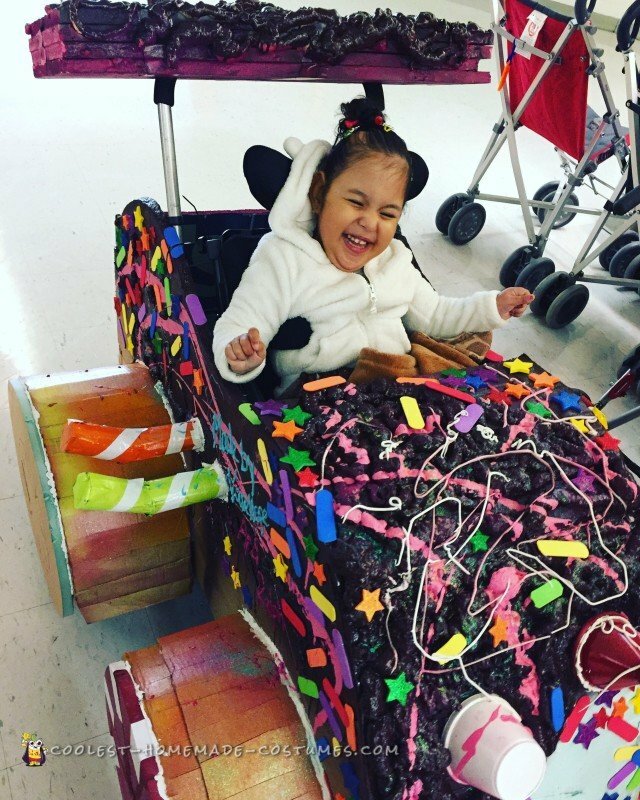 When I started thinking of what she should be for Halloween I thought it’d be wonderful to have her wheelchair be a part of the DIY costume. I wanted to have it be something that the world saw as an amazingly beautiful addition to my amazingly beautiful daughter. I wanted Abby to feel great about herself to enjoy a day where no one said “poor baby” but instead “that’s amazing!” And “you’re so cool!”. I began searching for ideas. One night watching wreck it Ralph it hit me, Vanellope, one of the main characters of the movie was perfect. She was shunned for being different and then it turns out she’s the princess. BUT she still has her perfect imperfections. Vanellope shows that you don’t have to be perfect or “normal” to be a princess/star. I made the entire car out of 1 inch thick foam boards from Home Depot. For the curved parts (ie, hood, wheel covers), I used cardboard. To get the texture I used spray foam, puffy paint, rubber spray, and craft glue. The entire thing was painted with spray paint (glossy only) the stars and sprinkles are foam stickers from Michael’s. The entire thing was built to be taken off the wheelchair easily by cutting 4 zip ties that held it onto the wheelchair. It took the entire month of October but the response was worth the work. When people saw us walking down the street you could hear the gasps and the “oh my goodness look how amazing”. Kids ran over to her wanting to play, which is so incredibly rare since they’re usually turned away by the wheelchair. Parents stopped to chat with me about typical things and they not once said “I’m so sorry”. This Halloween Abby dressed as Vanellope but this Haloween Abby was “normal”. 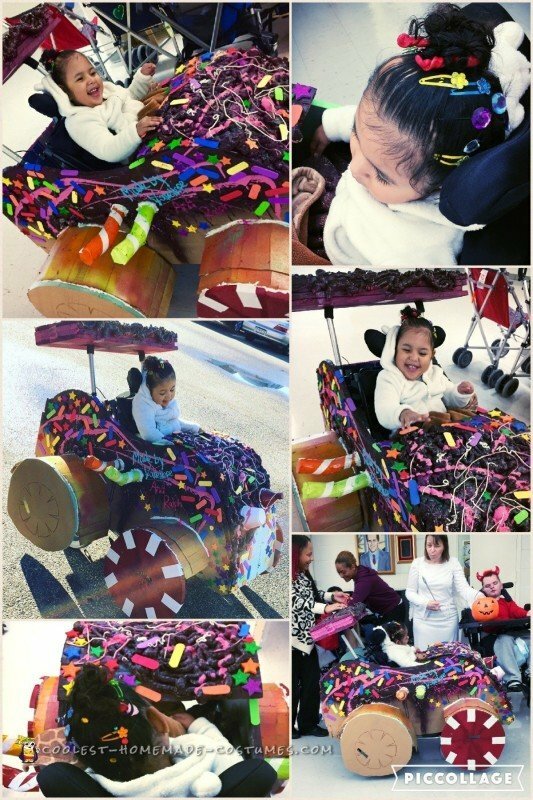 This Vanellope von Schweetz wheelchair costume has been the thing to make mine and my daughter’s year. We had so much fun and it was an absolute hit.